More strange tales from the North Country. Recently I mentioned one of the business surprises of the greater Burlington, Vermont area: a newspaper, called Seven Days, that has larger in-print circulation, a bigger staff, and higher revenues (including from classified ads) than ever before. Now here's another oddity of the north: a commercial airport whose stated goal is to take the stress, anxiety, hassle, and overall misery out of the modern air-travel experience. 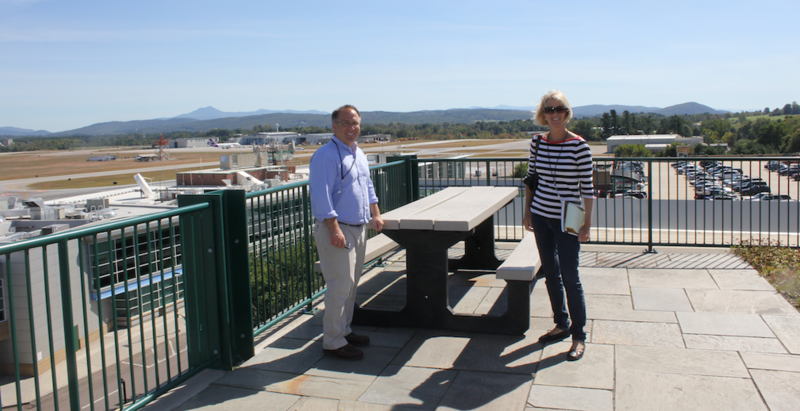 But recently Burlington's traffic has been going up, along with its revenues, and last Friday the airport's new director, Gene Richards, showed us some features I wish other airports had. 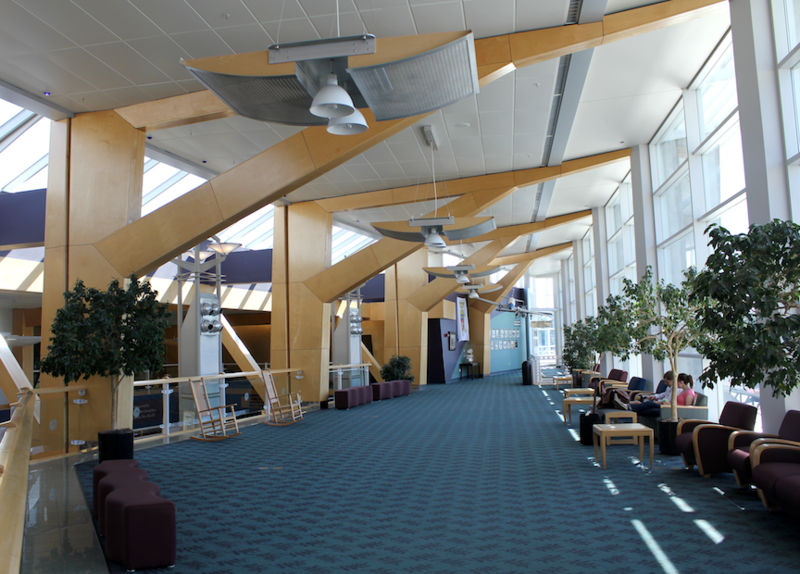 Richards said that to the best of his knowledge, Burlington, known as BTV, was one of three airports in the U.S. to have a yoga room. The others were SFO (natch) and DFW. "I even go in there to make my stressful phone calls," Richards said. "You feel calmer just by stepping inside." "One mother broke down and cried, out of gratitude, when she saw this," Richards said. "She said I couldn't imagine what this meant. And I guess I couldn't, fully, but it is one more thing to reduce stress." Here is a source of stress I can fully imagine: the maddeningly cheapo / cattle-herder attitude of so many major airports in making it all but impossible to find electric sockets (and capping or disabling the few that are there). And hey I am talking about you, whoever is responsible for making Dulles Airport such a feedlot-like experience. And your evil twins in charge at LAX. At the nearby cafe, a double-socket underneath each seat. Another sitting area, with aviation-themed decor. "We're trying to create the sense of a lot of separate spaces where people can go," Richards said. "Anything to make the experience seem more relaxed." Also, local drink offerings -- including (note the arrow) the elusive Heady Topper on tap. Yes, I know, I would probably dislike some other airport as much as I dislike Dulles if I were exposed to it as much. And I know that the contained scale of Vermont in general, and of this airport in particular, makes things feasible that you just couldn't do on a mass-volume basis. Still, it is remarkable the top-to-bottom difference it can make, if managers seem to have asked themselves what the experience is like from the traveler's point of view. I hope some of our big-airport managers make time for a trip up north.